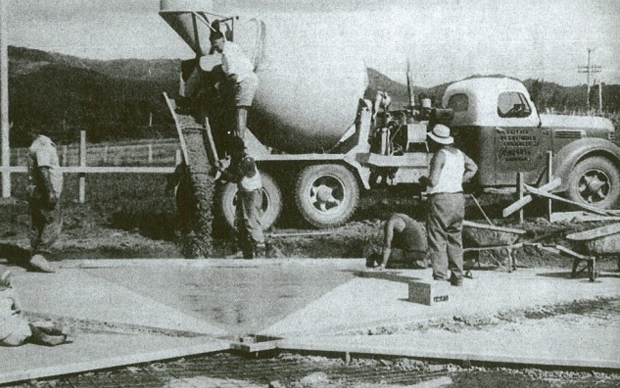 History of Concrete - Steve's U-Cart Concrete, Inc. In 1886, the first rotary kiln was introduced in England that made constant production of cement. In 1891, George Bartholomew, placed the first concrete street in the U.S.A. in Bellefontaine OH it still exists today. In 1903, the first concrete high rise was built in Cincinnati, OH. In 1930, air entraining agents were introduced to concrete to improve resistance to freeze/thaw damage. In 1936, the first major concrete dams, Hoover Dam and Grand Coulee Dam were built. In the 1970’s, fiber reinforcement was introduced to concrete. In the 1980’s superplasticizers were introduced as admixtures and the “highest strength” concrete was used to build Union Plaza in Seattle WA. In 1992 the tallest reinforced concrete building in the world was built in Chicago, Illinois (946 ft.). In 1999, Polished concrete was first introduced in the U.S.A. by HTC, a swedish company. They polished a 40,000 square foot warehouse floor for the Bellagio hotel in Las Vegas. As of 2011, the tallest reinforced concrete building is the Burj Khalifa in Dubai in the United Arab Emirates. This high rise building stands 2,717 feet tall, used 431,600 cubic yards of concrete and 61,000 tons of rebar. The history of concrete is really amazing, it’s hard to believe a material as old as concrete is such an important part of our “building infrastructure” today. Concrete is as important a resource to us now as it was to the egyptians when they built the pyramids.